Ever since last year’s Champions League final, there has been a battle between Germany and Italy for the number of Champions League places alloted to both countries. Inter were the sole representatives from Italy and they did make their country proud by defeating Bayern in the final, which helped Italy hold on to the elusive fourth Champions League spot. Inspite of their efforts this season, all the other Italian teams shamefully crashed out again in this year’s competition, thereby gifting an extra champions league spot to Germany, effective from 2012. Once again, Inter is the only Italian team left in the competition. It was crazy at the Allianz Arena!!! The Nerazzurri have undergone mixed emotions in the past few weeks. Their incredible win in Europe was followed by a hammering at the hands of AC Milan in the Milan derby. On a positive note, Inter have already eliminated a tougher German opposition – Bayern Munich – which should give them a lot of confidence to march towards another champions league final. However, to do that, the Nerazzurri will have to be at their best especially with the likes of Nauer in such remarkable form. Sneijder is also looking forward to face Raul, his ex-Real Madrid team-mate. Schalke are having a weird season. The Germans have been underperforming in the domestic circle, yielding only 33 points from 27 games and they are currently sitting in 11th position. However, Schalke have been quite impressive in Europe and they eliminated strong opponents in Valencia in the round of 16. A similar result against the current European champions would be a sensational achievement for the Germans. Meanwhile, former Schalke midfielder Andreas Mueller is confident that Schalke can beat Inter again. Samuel is the only notable key player to be out of this fixture. Julio Cesar will be hoping for a better performance from his back four after their disastrous display in the Milan derby. Inter fans will gladly welcome back Brazilian centre-back Lucio to partner Ranocchia after the former missed the Milan derby because of suspension. Maicon and Zanetti will cover the full-back positions. Stankovic, Cambiasso and Thiago Motta will create a compact central midfield and support Sneijder who will be the main source of creativity. Eto’o and possibly Milito will be paired up-front as Pazzini is cup-tied. Milito is yet to return to his best but this is a perfect occasion to re-announce himself. Inter will play with their regular 4-3-1-2 formation with the full-backs supporting the attacking midfielder and the two strikers. Cambiasso will be the holding midfielder along with Motta; both of whom will look to break the Germans’ play. Stankovic will play the role of a roaming box-to-box midfielder and support his attackers. This leaves Sneijder and Eto’o to be the main attackers and perhaps, the key to success for Inter. Eto’o, like always, will be the spearhead and will be given a free role to trouble the Schalke defense with Milito as the target man. While Gavranovic and Kluge are likely to miss the game, Metzelder could possibly be available for the huge European tie. Schalke will also field a 4-3-1-2 formation with in-form captain Nauer between the posts. Metzelder and Hoewedes will be in the center of defence to stop Eto’o and Milito. Uchida and Sarpei will have to be defense-oriented full-backs given the nature of their opposition’s full-backs and will be pushing Maicon and Zanetti towards the touchline with the help of their wingers Jurado and Draxler. Matip will be the holding midfielder and will be the main man for Schalke to link the attack and defense and he will also be responsible for breaking up play. Farfan who had an incredible game against Benfica will play in a slightly deep-lying playmaker role and will be the supply for strikers Raul and Edu. The main threat for Schalke will come from Raul, the former legendary Real Madrid striker who has a bag full of experience at this level. With his ever green goal-scoring touch in Europe, the Spaniard will definitely be looking forward to troubling the Inter defense. 1. Samuel Eto’o is the joint top scorer in Europe this season along with Messi and Gomez. 2. Schalke won the last time these two met in Europe via penalties in the 1997 UEFA cup. Undoubtedly, Eto’o has been Inter’s most consistent and reliable player of this campaign. However, Samu had a dearth of support against Milan which led him to be isolated on the left side of the play with the Milan defense double-marking him. The German defense may not be as good as Milan’s defense, though. On top of that, Eto’o has been the joint top-scorer in Europe which gives him more confidence to trouble the Germans and drag his team to the next round. On paper, Inter should ideally destroy the Schalke defense. However, there is one big wall in between the Nerazzurri and Schalke’s goalline and that comes in the name of Manuel Nauer. The German shot stopper has been in a class of his own ever since the World Cup and has been the saviour of the Germans, both at club and country levels. Without this talented keeper, Schalke are a safe bet to be a relegation candidate. In Europe, Nauer is one of the main reasons for Schalke’s continued European success thus far and the Germans need their star man to be in full swing against the European Champions. A high scoring result is very unlikely as both the sides will be cautious with Inter looking to take advantage at home. Inter will definitely get a goal or two considering the vulnerability of the Schalke defense but at the same time the Italians’ defense would be lacking in confidence after a thumping received at the hands of AC Milan. So, a close win for the Nerazzurri with an away goal for Schalke would be ideal for both the sides with the second leg a week away. Ever since the final of last year’s Champions League, there has been battle between Germany and Italy for the number of Champions League places for both the countries. Inter were the sole representitives from Italy and they did make their country proud by defeating Bayern in the final and helped Italy hold on to the elusive 4th Champions league spot. Inspite of that, all the other Italian teams crashed out this year shamefully and the 4th Champions league spot has been given to Germany effective from 2012. Once again, Inter are the only Italian team left out. Schalke are having a weird season this time around. The Germans have been underperforming to say the least in the Domestic circle which has yielded them just 33 points from 27 games and they are currently sitting in 11th position. However, Schalke have been quite impressive in Europe after they eliminated Benfica in the round of 16. A similar result against the current European Champions would be a sensational achievement for the Germans. Samuel is the only notable key player to be out of this fixture. Julio Cesar will be hoping for a better performance from his back four after the disastrous Milan derby. Inter fans will gladly welcome back Brazilian Lucio to partner Ranocchia after the former missed the Milan derby because of his suspension. Maicon and Zanetti will cover the full back positions. Stankovic, Cambiasso and Thiago Motta will create a compact central midfield and support Sneijder who will be the main source of creativity. Eto’o and possibly Milito will be paired up front after Pazzini had a bad game against Milan. Milito is yet to come back to his best but this is an occassion to prove himself. Inter will play with their 4-3-1-2 formation as usual with the full backs supporting their attacking midfielder and the two strikers. Cambiasso will be the holding midfielder along with Motta both of whom will look to break the Germans’ play. Stankovic will be a roaming box to box midfielder and supporting his attackers. This leaves Sneijder and Eto’o to be the main attackers as Milito is yet to regain his sharpness. Eto’o, like always will be the spearhead and will be given a free role to trouble the Schalke defense with Milito as the target man. Gavranovic and Kluge will most likely miss the Inter game. But Metzelder who is also doubtful will most likely make it for the European game. Schalke will also field a 4-3-1-2 formation with Captain Nauer between the posts. Metzelder and Hoewedes will be in the Central Defensive roles and will be looking to stop Eto’o and Milito. Uchida and Sarpei will be a defensive looking full backs given the nature of their opposition full backs and will be pushing Maicon and Zanetti towards the touchline with the help of their wingers Jurado and Draxler. Matip will be the holding midfielder and will be the main man for Schalke to link the attack and defense and he will also be responsible for breaking up play. Farfan who had an incredible game against Benfica will play in a slightly deep lying playmaker role and will be the supply for strikers Raul and Edu. Undoubtedly, Eto’o has been Inter’s most consistent and reliable player this campaign. But, even the Cameroonian couldn’t pull his side out of the mud on Saturday against their arch rivals Milan. However, Samu had a dearth of support against Milan which led him to be isolated on the left side of the play with the Milan defense double marking him. But, the Germans’ defense isn’t as good as the Milanese. On top of that, Eto’o has been the joint top scorer in Europe which gives him more confidence to trouble the Germans and drag his team to the next round. 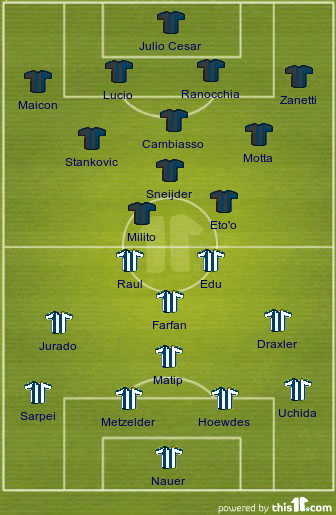 On paper, the Inter would ideally destroy the Schalke defense. 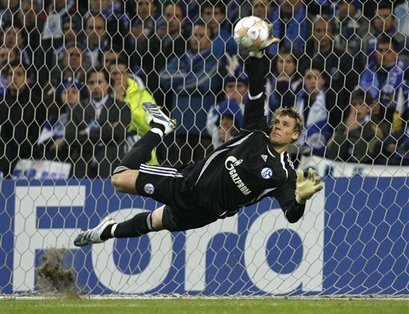 But, there is one big wall in between the Nerazzurri and Schalke’s goalline and that comes in the name of Manuel Nauer. The German shot stopper has been in a class of his own ever since the World Cup and has been the saviour of the Germans both at club and country levels. Without this talented keeper, Schalke are a safe bet to be a relegation candidate. In Europe, Nauer is one of the main reasons for Schalke’s continued European success thus far and the Germans need their star man to be in full swing against the European Champions. A high scoring result is very unlikely as both the sides will be cautious with Inter looking to take advantage at home. Inter will definitely get a goal or two considering the vulnerable Schalke defense but at the same time Inter defense is no good either after their trashing at the hands of Milan. So, a close win for Inter with an away goal for Schalke would be ideal for both the sides with the second leg a week away.